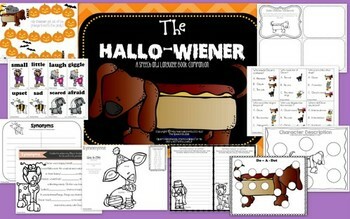 The book companion was created to be paired with the book, 'The Hallo-Wiener' by Dav Pilkey. 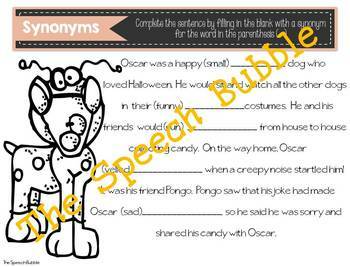 ( pages 5-9 ) Synonyms: Have students match the synonyms from the story and write the pairs on the included worksheet. There is also a fill-in-the blank story and coloring glyph. ( pages 10 – 14 ) Antonyms: Have students match the antonyms from the story and write the pairs on the included worksheet. There is also a fill-in-the blank story and coloring glyph. (pages 15-19 ) Rhyming Words: Have students match the rhyming from the story and write the pairs on the included worksheet. There is also a fill-in-the blank story and coloring glyph. 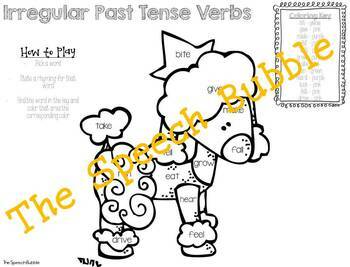 ( pages 20-24 ) Irregular Past Tense Verbs: Have students match the irregular past tense verb pairs from the story and write the pairs on the included worksheet. There is also a fill-in-the blank story and coloring glyph. ( pages 25-32) Verb Tenses: Have students sort the verb tense cards into the correct area on the included mat and write the tenses in the correct column on the worksheet. Next, have them complete the sentence with the correct verb tense. There are also fill in the blank stories for each verb tense. ( pages 33-36 ) Story Sequencing/Retell: Have students retell the story’s events in order. Attach velcro to mat and cards so students can attach them. Students may also make a mini-book by drawing and correctly sequencing story events. 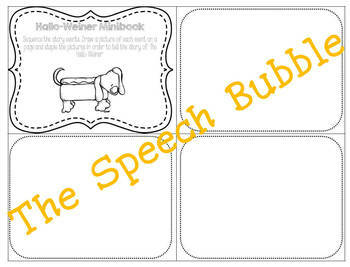 (page 37) Describing: Have students write a describing component of a dog in each circle. Then they may color the dog. ( pages 38-39) Following Directions./Basic Concepts: Give students directions to place the character cards on the included setting mat. ( pages 40-41 ) Compare/Contrast: Use the included venn diagrams to compare and contrast story characters or your own ideas. ( page 42 ) Context Clues: Have students read the sentence and determine the meaning of the underlined word. You can allow the students to chose from the given choices or create their own answer. ( pages 43- 48) Comprehension Questions: Read the question and choose the correct answer. The cards are level, having multiple choices with and without visual cues. (page 49 ) Writing: Student may write a letter to Oscar suggesting what he should be for Halloween next year. (page 50) Count and Color: Use as reinforcement during activities. Students roll a die and color the indicated amount of pictures. (page 51) Do –A- Dot: After students complete a task they may use a paint dauber, sticker, etc. to add a dot to the picture. (page 53 )Articulation: Have students locate their speech sounds in the story and after ‘X’ amount of productions they may color a picture. ( page 54) Pragmatics: Have students answer the pragmatic questions.